The Long-billed Pipit’s flight is strong and direct. 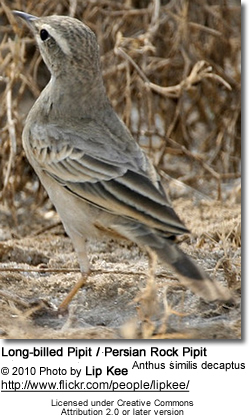 It gives a characteristic chupp call, similar to Desert Lark. Its song is like that of the Tawny Pipit, but slower and more varied, sri...churr...sri...churr…sri..churr. 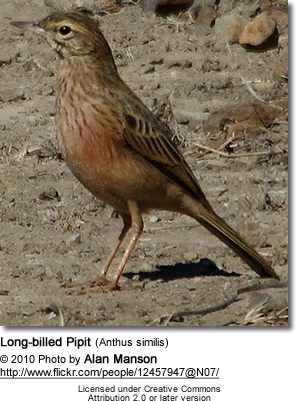 Like its relatives, Long-billed Pipit eats seeds and insects. 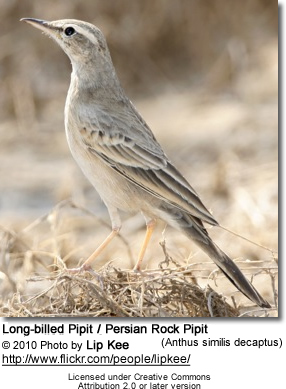 The Long-billed Pipit’s breeding habitat is dry open slopes with rocks and low vegetation. The nest is on the ground, with 2-4 eggs being laid.